Welcome to the used magic section of our website, here you will find magic items that have been used but are still in excellent working condition. In some cases, items will not have been used at all, we will make sure to let you know in each items description. If you have any questions regarding any of our used magic items, please free to contact us at EMAIL. The 4BAR™ is a pack-and-go must have for DJs, bands and other performers who want a complete LED wash light system. This is 15-channel DMX system. Each of the 16 low-profile lights can be positioned independently. With 108 red, green and blue LEDs per light, the 4BAR™ offers built-in automated and sound activated programs. Each unit consists of 2 full Chauvet 4Bar wash light racks (as pictured - 4 Chauvet 4bar wash lights in total) custom wired and bolted together so that each set of lights can be powered with a single plug for incredible convenience. The Elite Chair Suspension is a 1 person illusion! This model has enough improvements to be considered "An advancement of the arts". All improvements were made by Jay Leslie, so you know a lot of time and effort was invested into thinking them out completely. All in all there are several never-before available improvements made to this standard illusion making it the NEW standard of the industry. 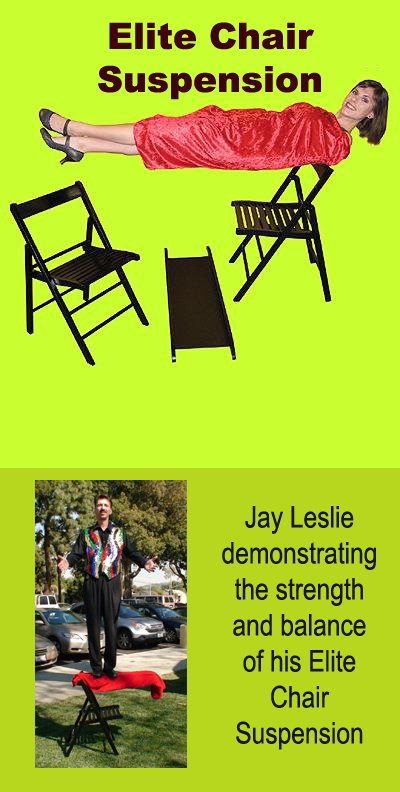 After you watch the DVD and see Jay sit and effortlessly lay on the gimmick, without it moving, you'll know exactly whet we mean when we say that it's an advancement of the arts. A complete set of detailed instructions has been created, including an exclusive DVD to show how to use your new illusion. Because this DVD is specific to the advancements on this model it is available only to those who take advantage of this exclusive offer and we urge you to do so while they are available. 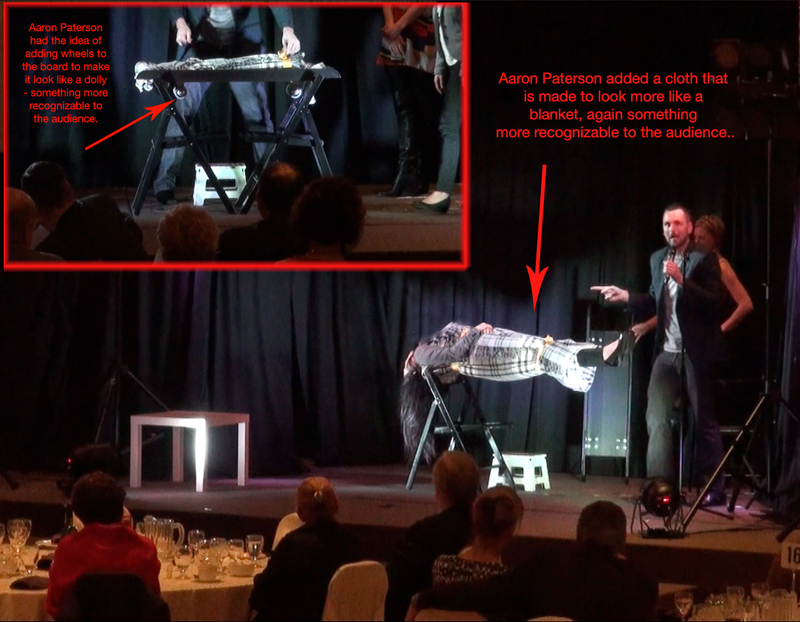 Magician begins by placing two chairs on stage and places a wooden board across the top of both. He then invites anyone from the audience (up to 325 lbs) on stage to lie on the board. While holding onto the board at her feet, the magician removes the chair closest to her feet. Next, he yanks the board from under her, and she visibly remains suspended in mid-air with only her head resting on the top of the remaining chair! 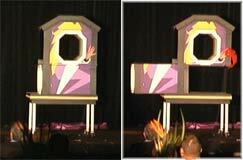 An impossible head-scratching illusion perfect for any type of performance venue! Don't confuse this with any other type of chair suspensions on the market today. This is solidly built and one that you'll use in every one of your shows. The gimmick portion of the chair is built of sturdy metal and this Chair Suspension can support a weight of up to 325 pounds, which means you can suspend either a child or adult without fear. 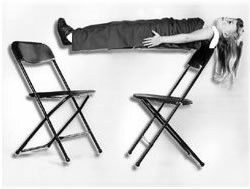 This perfect illusion will fit in the back seat of your car for easy transport, enabling you to take it wherever you go! Supplied complete with everything you'll need including a carry sheath. Cloth is made to look more like a blanket rather than a "magic cloth". Wheels have been added to the board to make it look like a dolly and in Aaron's presentation, the props for the Chair Suspension were wheeled out on the "dolly" to make the illusion feel more organic. Ribbon ties have been added to the cloth so that it can be tied in two places around the volunteer while the other parts of the cloth that are not tied in place droop down the way they would if it was just a cloth wrapped around the volunteer. This creates the perfect illusion that there is no support under the volunteer. Under your command a large, heavy looking silver ball is seen to levitate up and down, across the stage and back again only to land in your awaiting hands. 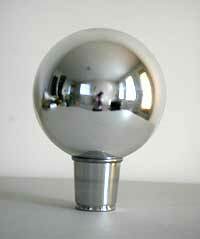 There are many options for how to make this ball float, in fact there are entire books dedicated to the subject. Basic handling insrtuctions are included with the ball. These balls have become collectors items as Don Wayne is no longer manufacturing them and so therefore we have priced it accordingly. This ball was originally purchased for use in a television commercial and was never used. The Mak Magic Chair Suspension is a 1 person illusion! NO assistant is required, an audience member can be used. Perform completely surrounded clear of back-drops or drapes! 2 Chairs are set face to face, with a long wood board on top. A person lays on the board and is briefly covered with a cloth. You remove the chair supporting their feet, they are SUSPENDED! Wave below them, there's nothing to find! Put the chair back to support their feet, all is fine now. The spectator goes back to their seat. This lightweight mystery packs flat and is ready to be shipped or transported anywhere in the world. Originally Paid $650 for this item. This Chiar Suspension shows some wear but is in Good Working condition and still looks great on stage or in somones living room. Doves to Rabbit is a fantastic illusion that is performed with lightning speed! The illusion packs flat, yet will certainly be the focus point of any dove act! Not to mention, this is a high quality version of this magical classic! One to six doves are produced in various ways (to be chosen by the performer). As they are produced, each dove is placed into a cage on a perch, where they are in full view at all times. After the last dove is placed into the cage, the top of the cabinet is lifted off. The sides of the cabinet drop down to reveal a LIVE RABBIT! The doves have vanished completely! You need not necessarily use doves or a rabbitt in this wonderful illusion. This is a utility device that can be used to visually transform any item that will fit in the first load space to any other item that will fit in the second load space. 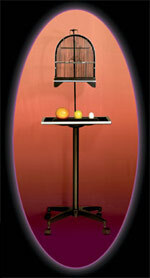 This illusion was built from the highest quality materials by Chalet Magic and packs flat for travel. 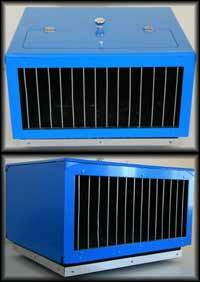 This is a very large version of Doves to Rabbitt that will easily fit 6 doves. The effect is simple and straight forward. Magician shows a birdcage with a parakeet inside (live bird is used). He then removes the parakeet from the cage and vanishes it in a handkerchief. He then takes an egg and vanishes it the same way. Next a lemon, but when he gets to the orange, he finds that he cannot easily vanish it. Taking out a knife, he cuts open the orange and inside he finds a lemon. Quite surprised, he cuts the lemon in half only to find the egg! He then takes the egg, breaks it open inside the cage and the live parakeet reappears. Definitely different and so easy to perform due to the fine manufacturing of the cage. This could easily be a closer for any type show. Custom cover for the cage (cover matches the devils hank). Comes apart and packs in ATA case. NOTE: When purchased new, this item is $1995 USD. The Perfect Opener for the Manipulator! Magician enters the stage with a cane in his hand. When ready to perform, he twists the cane which changes into a three legged stand. He places a hat, a magazine, etc., on the cane, which now becomes a handy table! This item is used by top professionals around the world. It is endorsed and used by the Great Tomsoni! Top Hat is NOT included. 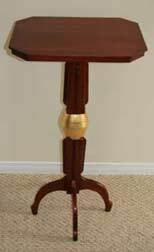 This Norm Nielson Cane to Table was purchase directly from Norm for $495 USD and is Excellent Condition. Only used a handful of times. 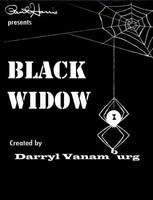 Paul Harris Presents Darryl Vanamburg's "Black Widow"
There are those that believe The Black Widow may make many sleight of hand moves obsolete! The Black Widow was designed to do one thing very, very well. It does this one thing better than any other device or sleight of hand technique currently available. This one thing will let you experience how it feels to effortlessly create perfect miracles! The Black Widow enables you to invisibly exchange objects on a spectators hand simply by waving your empty hands over the spectator's hand! Your hands are absolutely 100% empty immediately before and after the effect. There is NO ditching, palming, or extra finger movements! Just a simple wave of your empty hands and the magic happens right on the spectator's open hand. Seems impossible, but with The Black Widow the impossible easily becomes POSSIBLE! Real magic is within your reach! Joe Porper's new AmaZeRING will revolutionize the Himber ring routine. The ease of use with AmaZeRing is astounding; the gimmick opens and closes automatically without an fumbling or looking. It's a great new tool for the worker. Three rings are borrowed from the audience and are linked together in a chain. One ring is unlinked and returned, the other two are displayed on a mechanical pencil with one hanging below. On the magician's command, without touching the rings or going near them with his hands, one ring visibly unlinks from the other and drops into his waiting, cupped hand below! It can also be used in a ring on/off stick or cord,and other effects, only limited by your imagination. The first, and simplest routine we call the "Ghost Link and Unlink." 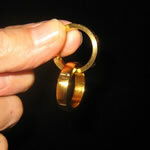 This was created originally by Earl Nelson with the full-size linking rings, but is easily adapted with the AmaZeRING. The cleanup/switch routine is easy to do and it is based on Dai Vernon's display of balls in the beginning of his cups & balls routine. Comes with gimmicked ring and ungimmicked ring with photo-illustrated instructions and DVD with performance and routine by Dean Dill and Joe Porper himself. This item was originally purchased $350 to have as a back up and has never been used. Like New Condition! This table was custom made for me by Losander and is the size that he actually uses when he performs (much larger than the standard tables). The perfect levitation effect. It can be performed surrounded. Imagine a solid table that mysteriously begins to rise from the floor and then suddenly takes off! This table floats all over the place with a life of it's own, all the while being controlled by the performer. A volunteer can look around and under the table while it floats in mid-air! Based on Tommy Wonder's levitation principles, Losander has created from this system a new miracle. There is only one Floating Table which has the rights from Tommy Wonder and this is it. Don't accept any cheap imitations. Get the original. High quality craftsmanship imported from Germany. When Losander custom made this for me, it was $3000 USD. It has only been used a handful of times and is in "like new" condition. Here's the picture. Performer borrows watch from a willing spectator. For protection, the watch is placed in a little black drawstring bag and hung on a fish hook. Performer is handcuffed, and the keys are placed in a little red bag, which is hung around the spectator's neck for safe keeping. A lit candle is placed beneath fishing cord. Object: Performer must escape from handcuffs before candle (A) burns through cord (B) dropping watch (C) into food processor (D). Performer sets timer clock, telling the audience that it takes precisely one minute for the cord to burn through, but with any luck at all, he can escape in about 38 seconds. Clock begins to run. Performer struggles, managing to release one hand at about 30 seconds. Slowly, however, the candle begins to tip, igniting the watch bag! Horrified, the performer rips the bag from the stand and throws it to the floor, stomping all over it to put the fire out. Everything once more under control, performer realizes what he has done. He picks up the bag, which now exudes a loud, ominous rattle. "Well, at least I got one hand free", he proclaims. "Tell you what", he says confidently. "I'll wave my hand over this bag. Then, you take it home with you, put it in the back of the darkest closet in your house. Five days from now, at midnight, open the little bag and you'll find that your watch is restored, good as new." Spectator is thoroughly unimpressed. "Better yet", says the performer, "if you'll be good enough to give me the keys so I can unlock my other wrist, I'll restore the watch for you immediately." Spectator opens the little red bag that's been hanging around her neck. Inside, she finds not the keys, but her watch! If you haven't figured it out by now, this is a real comedy spot in any act. Action, comedy, tragedy and magic make this one of the greatest interludes in any act. Comes complete with custom ATA case. Highly recommended. Imagine being able to walk out and at any point in your show, being able to LEAN to an almost horizontal position, (literally an arm's length from the floor)! You now lean back up straight and continue on with your act, with complete mobility! Billy McComb - "Fantastic... Doug Malloy has brought a wonderful classic back to life, that is extremely well made. A whole act can be built around this". Kevin James- "Very Cool... Great for any variety act - magicians, clowns, jugglers, musicians, etc..."
This item comes with modified, above the ankle, black boots in a size 10. The boots are like new as they have only been worn on stage 3 or 4 times. Originally purchased for $650 USD plus the cost of the boots which were $135 USD. To watch a demo video of this effect, click the play button. Not many other effects are as striking and magical as Instant Dove. At the end of the show, the magician produces an egg from his pocket. He hits the egg against the table he has been using during the whole routine; he shakes the egg, and a colorfully brilliant rain starts falling from it. Unexpectedly, the egg falls onto the table and transforms itself into a real live dove. The dove does not simply appear from the egg, the result is due to an instantaneous transformation! 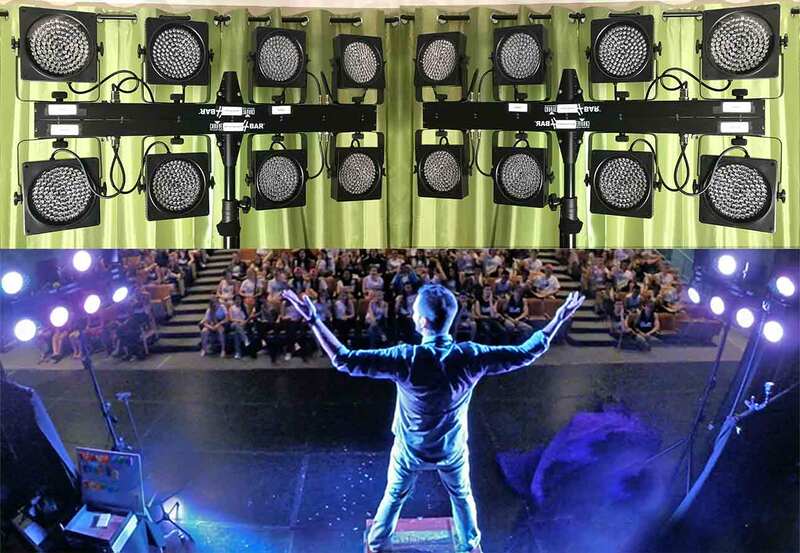 Wireless Wizardry's (Now CES - Creative Entertainment Solutions) Showtech is a state of the art system providing the entertainer with complete control over all technical aspects of their show. 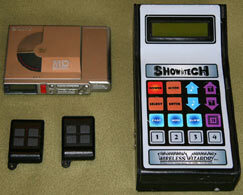 The ShowTech will control all music cues as well as volume control and fades. No more miscues due to a inattentive sound operator. Your music and effects are certainly the most important aspect of your act. Program 5 different shows into memory with each show up to 50 music tracks. Quality sound can be recorded on the included Sony Mini Disk, remote track cuing, volume control auto-pause, auto-fade, up to 100' thru walls. All cords and accessories included. Also includes ankle transmitter for hands free remote operation. Cabeling is absent from photo for clarity. This item is priced to sell quickly and won't last long, so act now and get your hands on Wireless Wizardry's (Now CES - Creative Entertainment Solutions) ShowTech, the system preferred by some of the top names the business. A small, raised cabinet is opened and your assistant takes her place inside. The box is then bisected with a wide, polished stainless steel blade. The front cover is removed and two large tubes are thrust through the cabinet. There seems to be no place left for her to hide! Then comes the kicker...the entire bottom section is slid to the side (a'la Harbin's Zig Zag Girl), effectively separating the halves. You can revolve the illusion at this point (you can actually revolve it at any point you like) to show all sides. The audience wonders if she disappeared. Her hand pokes out through an opening in the front. She's still there...but WHERE?! Then all is reversed and the assistant emerges completely unharmed. This amazing illusion can be presented close-up, surrounded, absolutely NO ANGLES to worry about. Comes completely apart and packs in two fibre cases (cases included). 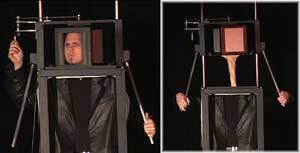 This illusion never fails to get gasps from your audience - the illusionist gets into the contraption pictured and proceeds to use the side lever to twist his head around 360 degrees, that's right, "twist his head around 360 degrees", this must be seen to be believed. 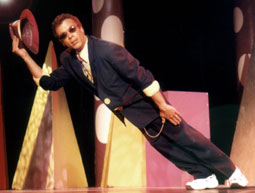 He continues to spin his head until the audience can't handle it any more, at which time he proceeds to lift his head right off his body stretching his neck in an unbelievable manner (as pictured). This never fails to get an audible gasp from the audience! 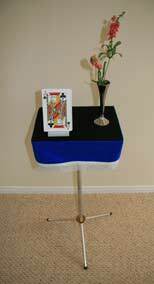 This is a one-man illusion that packs small and plays really big. When disassembled the illusion can easily fit in the back seat of a car. Jumbo Sidekick is the single hottest stage and platform prop in Collector's Workshop history. A spectator selects a card (say, the 4 of clubs) from a jumbo deck. Using a pistol, the spectator attempts to shoot the chosen card out of the deck.... But ... BANG! the table drape falls off ... BANG! .. the flower flies into the air ... BANG! .. the entire table tips, dumping everything onto the floor, except a jumbo five of clubs, which adheres to the table...... "It's not my card," says the spectator. Not missing a beat, the performer takes the gun ....... "Let a professional handle this! "....and BANG! .. the performer shoots off the center pip. "It is now", says the performer with a triumphant wink. The entire unit is an electronic marvel. Only the finest workmanship can give such satisfying results. This item packs very small and plays big. A Mic Stand that has been used throughout your performance is balanced horizontally on the backs of two chairs. The magician drapes an attractive blue cloth over the Stand leaving the Mic Clip and the Base uncovered. The chairs are then removed and the Mic Stand remains suspended in mid-air. It begins to float back and forth and even revovles around and floats in front of the cloth under the magicians control at all times. It floats back to the horizontal position and the magician uncovers it to show that it is just an ordinary Mic Stand. As a clever finale, both mic and magician take a bow (Mic Clip with Mic in it tilts up and down as if taking a bow, under the magicians complete control). This is a very clever prop that can be made into a substantial comedy routine. 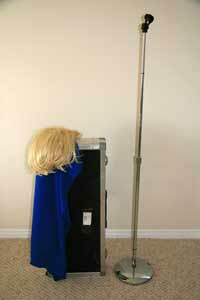 Comes complete with the Mic Stand (comes apart for travel), heavy duty ATA case, cloth, video tape instructions, gimmick, and a blonde wig for a comedy routine. Pour white milk, chocolate milk, strawberry milk, orange juice, cola, clear soda, tomato juice and lemonade all from the same carton. Pass the drinks out to the audience for tasting. They are real! Then tear the carton open an hand it to the audience. A real mystery. This version has been featured by Lance Burton, Doug Henning and Luis DeMatos, and on VH-1 TV's "Celebracadabra" among many others. Used for one summer season doing resorts.